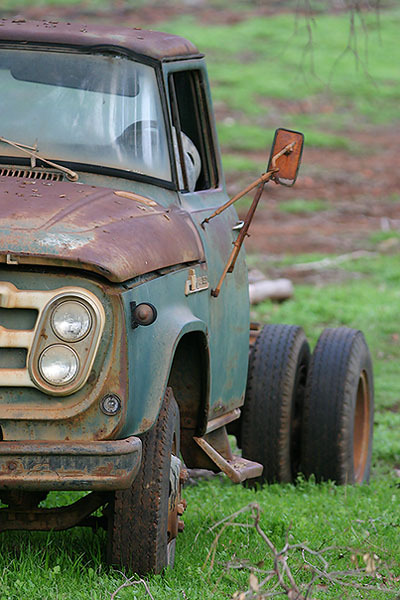 Have a good look; take it in, you won't see rusted old trucks and cars on farms for much longer. With the price of steel on the up & up, it is now economically viable to take scrap metal from the country to feed hungry steel mills. While this is good news for the farmers - they get the double bonus of cash and old junk being taken away - it is bad news for truck and car enthusiasts. Long time has the paddock been a source of old vehicles suitable for restoration. After all, there aren't many places in the city where a clapped out FJ Holden can be parked and walked away from, forgotten for a few decades until it is a collectors item. For each Mark I Cortina or "S" Series Valiant that is unceremoniously scooped up and crushed, there is one less option for a car restorer. Be quick, grab yours now before they are all gone.